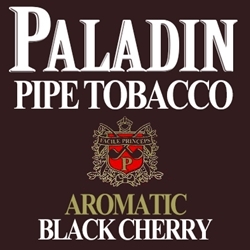 Paladin Black Cherry Pipe Tobacco is a classic blend of loose cut Virginia and Burley tobaccos that are flue cured to create a mild-bodied, slightly aromatic smoke that has been a staple among the pipe and cigar faithful since day one. Once you ignite Paladin Pipe Tobacco in your favorite smoking pipe, you will feel a unique and captivating taste of a mellow flavored high quality tobacco intensity that yields a smoking experience that is smooth and relaxing. What makes Paladin Black Cherry Pipe Tobacco different that other premium pipe tobacco brands is the notable pleasant room note of black cherry aromas that emits into any area in which you are smoking. Still a consistent best-seller, try out this legendary pipe tobacco brand at our discount online price today! Paladin Pipe Tobacco is distributed nationwide by Lane Limited with Scandinavian Tobacco Group, Copenhagen, Denmark. Paladin Pipe Tobacco is offered in unique styles to choose from. Currently available in Black Cherry flavor. Here at Smokers Discounts we offer you a great way to relax and enjoy a great quality smoke at an inexpensive price. Paladin Pipe Tobacco is an excellent choice for your pipe smoking needs. Our online tobacco store was created to make it easy and affordable to buy pipe tobacco. Call us for more details!